Water | Water We Doing? A great amount of knowledge lies in villages but we rarely think about reaching out to the locals for this knowledge when we try to address the problems they face. The name of the pond in the picture is ‘budhaa le khaneko pokhari’ literally meaning a pond dug by old man. I was more than thrilled when I saw this pond in one of my field trips to Kavre. Though the ponds in the villages have some kind of local names such as sano pokhari (small pond) thulo pokhari (big pond) and so on, but it was the first time that I came across a pond with a sign post, named after the budhaa who dug it. The reason why it had a nicely written sign post is because the pond was right at the entrance of an army post that helped preserve it along with its name. In recent days, the importance of dug-out ponds has increased more than ever before, and will continue to be so, because the local water sources and the springs in the hills have been progressively drying or have already gone dry in many places when the demand for water is increasing by the day. Change in rainfall pattern, change in land use, and most importantly utter disregard to the age old way of managing rainwater have perhaps collectively led to depletion of water yield in all local sources. As a result, the conventional technique of bringing water from far away sources using pipes, which has been a major programme of all development plans of the last 4 decades, has also been unfeasible in many places because the sources have shrunk all over. In addition, people are more concerned about sharing their water sources with others. Therefore, water managers find it increasingly frustrating to operate water projects and provide required water to the users in the face of reducing yield in the sources. Despite tons of material and information produced by thousands of researchers in the last several decades about how to manage water, we have landed in a situation with water problems becoming acuter in the period when a substantial amount has been invested in water projects and its research. Water is a local issue. It is as diverse as the landscape. Where would one find diverse landscape than in the hills, which are not just naturally raised area of land but a complex system of geology and topography that regulate water flow within a watershed boundary? Without understanding the local geological complexity, managing local water will not be easy. In essence, we have yet to understand how water is regulated by every watershed (they are all different because of their diverse nature). We are fortunate enough to still have some of the work done by people like this self-motivated budhaa who had knowledge of water conservation and energy to dig ponds, which lasted for decades and continued to provide water to the local sources. But we failed to understand what they did for the larger good of the community, and perhaps of the nature. Therefore we built roads where ponds existed before (picture below). A great salute to this selfless ‘Budhaa’ (who is no more now) for leaving something to learn about the importance of ponds by digging this one. The army post deserves appreciation for preserving it for us to observe. But a big question remains: with the rising rate of depopulation in the hills do we still have selfless ‘budhaas’ to continue digging ponds? The El Nino of 2015/16 has been one of the strongest with severe impacts felt in many parts of the world including South Asia. In India, for example, water shortages in already water scarce areas of Maharashtra and Bundlekhanda have been quite severe. In order to meet the minimal water needs of the people, the government transported water to the area using railway bogies. The situation in Nepal is not as severe but much more difficult to deal with due to its poor infrastructure, institutions, and resources. In Nepal, water shortages have been seen from districts of Panchthar in the east to Bajura in the west and from Siraha in Terai in the south to Gorkha in the north. Most small streams and springs in the mountains have dried. Water levels in the rivers have been at their lowest. Groundwater in Tarai has significantly depleted. Of course, nearly 31 districts in central Nepal were also affected by the 2015 earthquake which damaged or deformed the aquifers leading to a temporary rise in water discharge in the springs, but which have reduced and dried up thereafter. The water shortage across the country is, perhaps, an indication of an emerging problem which is not only large in size and coverage, but something that is poorly understood. Hence, the current water shortage needs to be looked at from a different perspective than just a normal dry period following a failed winter rain. In city areas where the municipal water corporation supplies domestic water, water is supplied to the consumer through tankers, but the shortages caused by the drought is also affecting farming and other water consumers. There has been no plan of action on the government’s part to address such problems. Conflicts near the water sources in regards to the allocation of water have been common, but with growing shortages, it often turns into minor scuffles and physical spats. The critical thing that we need to realize is that our capacity, as a society, to deal with unprecedented events is very limited. The EQ has further illuminated the limitation of our institutions and bureaucratic machinery to plan and address problems when they happen over a large area affecting thousands of people, who need support both in the short and long terms. Here is a need to focus on the following key areas. A general understanding about water as a key natural resource has been that more trees equals more water. Therefore, deforestation was blamed for all floods and water shortages ever since the environmental movement began in the 1970s in Nepal. The good news is that after the successful implementation of community forestry, the greenery has improved significantly and, as claimed by the latest survey of 2015, the forest covered has increased from 39.6% to 44.75%–a significant increase from the initial goal of 40% cover. But then, why is water shortage increasing despite a significant increase in forest cover? It only raises the question that we have misunderstood or exaggerated the forest–water relation. It is not as simple as it was believed to be without any evidence. A recent study by South Asia Institute for Advanced Study (SIAS) in Roshi Khola watershed revealed that in a small watershed which has a forest cover of near 85%, the water discharge in the river has declined gradually. The demand for water is increasing with increase in population as well as in economic activities and the change in lifestyle of people. Without an improved understanding of the degree to which the demand for water has increased and a blueprint of how has it put pressure on each of the local water sources in water scarce areas, it is unlikely that we will be able to solve the emerging water crises in the days ahead. The conventional approach of tapping into additional sources within the watershed or inter-basin water transfer to provide water to meet the demand will not work because; i) there is less water in all possible sources because of a reduced yield across the country, and ii) there is already a growing sense of ownership of the resources and local people are unwilling to share water to the communities outside the watershed as they did in the past. The question of payment for water also may not be an answer because of visible decline in water at local sources and increasing demand. The drought has not only caused a momentary problem but has also shown what lies ahead in the future and where our weaknesses lie in terms of institutions, policies and our understanding of water and its management. Gone are the days when we took monsoon rain for granted and expected it to fill all our aquifers which would continue to supply us with water throughout the winter. Now, we need to realize that a major change has occurred in local water cycles. The August Springs (also called the Saune Mul in Nepali), which burst into life for a month or so in August, are indicative of the fact that the aquifers in the hills have fully recharged and are capable of yielding water for a long period in the dry months of winter. Unfortunately, in many areas in the hills and mountains, the August Springs have not burst in the last decade. It only means that the aquifers have not been fully recharged to provide water in the dry period. The reason why the aquifers have not been fully recharged since so long is not known. It is definitely not deforestation as we have believed it to be for many years. Water in that sense has been a neglected field of development and always taken for granted. We did enough of leap services. We marked many Earth Days and Water Days, and vowed to take steps to manage water. We talked brilliantly about managing and saving water. But, in reality, we have neither learned to manage water nor have we learned to save it, let alone actually doing it. Our understanding about water has not improved. The way we (mis)use water remains as it was when there was plenty of water for a limited number of users and limited economic uses. But things have changed and changed for good. Now, there are a lot more users trying to tap water from the same sources, which are declining in yield. For people in the village of Bhakunde Besi in Kavre, water shortage began in 2007, when they failed to plant paddy due to insufficient rain and reduced flow in Dapcha Khola, which flows through the valley. They still hope that someday the river will have enough water for them to irrigate their farm. There are many such areas where people have suffered due to water shortages for years and yet remain hopeful that the situation will improve one day. But the fact remains that their woes have only deepened further with the current drought and will continue to get worse with current management. There is a need to look at the entire water issue more seriously and begin to prepare for what lies ahead, which is a more intensely amplified case of ‘too much’ water in the monsoon and ‘too little’ water during the rest of the year. When Will Water Become a Priority? The safety of millions of people in the earthquake affected districts is of concern in view of the approaching monsoon and loosened mountain slopes with widespread cracks on the ground. Many settlements are said to be extremely vulnerable and may not stand a chance when the monsoon rains arrive –they may just get washed down by landslides. Therefore, while relief, recovery and construction of makeshift shelters are on, the government has also started sending technical teams to assess the situation in the ground. The Ministry of Home has formed a technical team of geologists and other experts to conduct a preliminary ground assessment and recommend possible measures so that the government can take necessary steps possibly in the following key areas. Identifying extremely vulnerable areas from where people must be relocated to safe places before the monsoon begins. Identifying some ‘quick and dirty’ measures, if any, to reduce vulnerability in areas where hazards can be reduced to ensure safety of the people. Identifying possible measures to ensure smooth functioning of the infrastructures including the roads, the highways and the power plants. Similarly, the Ministry of Environment has formed another committee with support from the WWF to study in detail its one point agenda – the damages caused by the earthquake to the environment. Ministry of agriculture has already assessed the damage caused by the earthquake to the agriculture sector and has developed plans to distribute seeds and fertilizer for summer crop. It is believed that the farmers have lost their paddy seeds when the houses collapsed. Though, it has not come out in the news yet, it can be assumed that other technical departments have also assessed or are in the process of assessing the damages to their area of interest. The point that needs to be emphasized is, though these initiatives are important as they bring valuable information, it is unclear how and who will pull them together to develop an understanding of the overall impact of the earthquake and formulate plan of actions that needs to be done in a coordinated manner. This brings us to the issue of the structural shortcoming that we have unwittingly become victim to. The weakness of the sectoral ministerial system is that there are no agencies to address cross cutting issues. The ministries are not interested in areas outside their official area of concern. The core area of ministry’s interest is even reflected in naming the ministry. The classic case in hand is the changing of the name of the Ministry of Environment several times, from Ministry of Population and Environment (MoPE), to Ministry of Environment, Science and Technology (MoEST), to the current name of Ministry of Science, Technology and Environment (MoSTE). It only shows the intention of reinforcing the boundary of its scope. In principle, the role of the planning commission is to coordinate the development activities among the ministries and monitor their progress. Since, it strictly goes by the ministry, the commission has no role either to influence in the area not represented by ministry. This is one of the reasons that the government creates a new ministry if it is deemed necessary to emphasize particular area. Ministry of Poverty is another classic example created three years ago to lay emphasis on poverty alleviation, while the issue should have been (and in an informal way it probably is) at the focus of all ministries. Now, coming back to the impacts of earthquake, I believe that the most critical of all the impacts will be that on water sources, which will then impact the other areas of concerns. Because, when the picture of local water regime changes; when the local water cycle changes; when the availability of water at local sources changes; it will have tremendous and lasting impacts on the environment, agriculture, economy, health and sanitation, energy, and the overall living condition at local level. But there is no way we will have sufficient information about impacts on water sources, simply because there is no responsible ministry to emphasize the study of earthquake impact on water sector. The Ministry of Water Resources has now been split into Ministry of Irrigation and Ministry of Energy. The role of Water and Energy Commission seems important, but not sure what it is doing. At present, it looks like ‘water’ is not a priority. People, in general, are slowly beginning to come to terms with the widespread destruction of lives and properties that we witnessed two weeks ago in central Nepal. Relief materials have started to reach even the most remote places. Tens of thousands of hands have come forward to help salvage belongings and build makeshift shelters. Pledges have been made at national and international levels to restore and reconstruct; buildings, infrastructures and cultural heritage. We are somehow coping with the tragedy and getting used to the aftershocks. But, sadly, the tragic saga of the earthquake (EQ) will go much beyond these rehabilitation and reconstruction and continue to hound the poor who struggle to manage two meals a day for the family. Yes, it is the loss of livelihood base – the farms and the animals. Thousands of animals, a large number of which were kept for selling milk, have perished in the rubble. Hundreds of thousands of hectares of farmland have been damaged and terraces have given up. Water sources have been displaced or damaged. Poor farmers have become poorer. The extent of damage caused by this powerful EQ to the landscape and subsequently to the livelihood base and the economy is so deep and wide that it will take some years for us to begin to realize what it has done to mountain life in Nepal. It is because the seeds of many potential problems have been planted now. They will only grow over time, but unfortunately, the attention the destruction has received now may no longer be there to address them. Information coming out suggests that thousands of landslides of various scales and sizes have been seen in the EQ affected districts. The landslides were reported being very serious in the districts of Sindhupalchok as they blocked vital roads. The highway between Barabise and Tatopani near the Nepal-Chinese border was blocked by landslide debris at numerous places. An amateur video posted on the net showed violent shaking and destruction of mountains in another area of Sindhupalhok, in which the entire mountain slope seemed to have collapsed. The districts of Kavre, Nuwakot and Gorkha may have been jolted in a similar manner too, but information has yet to come. There were also some reports of landslide debris blocking rivers and Khola (streams). So far we haven’t received any information about the damages due to bursting of landslide blocked lakes. The rivers probably washed the debris before the lake behind the dams reached some critical level. What is worrying is that a large number of cracks on the ground have been seen in all EQ affected districts. The sizes of the cracks are as large as a meter wide and 3-5 meters deep in some places. They may be even deeper in other places, which need lots of field work to verify and assess. These cracks are likely to develop further when monsoon sets in, which is a little over a month away. Depending upon the nature of rainfall and the size and the depth of cracks, which we do not know at this stage, a large number of landslides and gullies are likely to occur in the coming monsoon. These landslides and gullies will destroy the farms and villages in the upland, and deposit debris on stable farmlands located at lower elevations. In turn food producing land below that has not been damaged by EQ will be lost too. Along with it, we can also expect a massive amount of sediment in the streams, which will get deposited along the rivers and in the fertile farmland in the valleys. In the process, the river flow may change with further implication of bank cutting and undermining the stability of river terraces, which are generally resourceful areas in the mountains. The cycle is very likely to repeat in the next monsoon too. The third and very critical aspect of these changes is the changes in availability of water. With the violent shaking of the upper aquifer in the mountains, most springs in the higher elevations are likely to disappear because water yield in the springs and streams have been temporarily increased at lower elevations. It only indicates that the aquifer is depleting faster. In such cases, making domestic water available to the villages in the upland will be seriously hampered. Quite a large number of drinking water systems are likely to be dysfunctional as the springs or streams they are hooked to have shrunk. With shrinking of upper aquifers and the change in the landscape it is very likely that the regulatory function of the watershed has been altered and may not yield the same amount of water in the dry season as it did prior to the EQ. It could very well mean that the flood events in sub-watersheds would also increase. In sum, the long term implication of the EQ to the livelihood bases would be seen in loss of: a) food producing land, 2) grazing land, and 3) water sources; within the watersheds. A genuine support to restore livelihood bases would require a serious reading into the developing scenario of land and water resources as well as into the supposedly altered water regime. The restoration of land and water is, therefore, key to restoring livelihood bases. However, that no program was ever developed in Nepal to reclaim damaged land and water resources only reinforces the fact that they were not genuinely viewed as important. Consequently, even when a large number of springs have gone dry in the hills in the last decade and even when thousands of hectares of fertile land in the valleys have been buried under debris across the country in the last five decades, not a single project has been developed to address them. Nor is there any agency to even register them as an environmental problem. This EQ, sadly, is going to bring to the fore the land and water problem at a very high cost. Let’s hope, a new chapter begins in understanding limitations as well as opportunities in building livelihood bases in mountains. A healthy life and proper diet is what people work hard for day and night. But if you get to drink milk that has coliform count up to 2400 in a millilitre, I guess that’s not really happening, eh? Recent news about the presence of coliform in the milk should be taken as a wakeup call to examine if there are other wrongs associated with this knotty field of dairy industry, where thousands of farmers, a number of middle men, and some profit hungry entrepreneurs are involved on a daily basis. Thanks to the government for making this case public and also sealing some of the dairies which were found to be selling contaminated milk. A systemic flaw in dairy business often results in coliform contamination. Local cooperatives collect milk from farmers. While transporting the collected milk to the chilling centres the cooperative adds water and soda to keep the milk from curdling, because milk rich in solid-not-fat (SNF) curdles fast in summer. Milk producers are paid on the basis of fat content only, whereas the cooperatives get paid separately for the fat, SNF, and lactose contents of the milk as well as ‘total solid commission’, which is calculated as some percent of fat, SNF, and lactose; and the quantity of milk transported. The contractor makes profit because he increases the volume by adding water and transports more milk (detail information available in Bhattedanda Milkway: Making Markets Accessible to Marginalized Farmers in Ropeways in Nepal, 2004). Since a substantial quantity of water is needed, the cooperatives do not hesitate to use water from any source, including unsafe sources. This is where the problem generally begins. The demand for milk and milk product is rising and so is the number of dairy industries. But, the production of milk in many areas is falling due to either shortage of workforce to look after animals or simply because farmers are abandoning animal husbandry due to lack of water and grazing land. In the last four decades, most of traditional grazing land around villages has been converted into forests for environmental protection. Lately, springs in the mountains have also begun shrinking. Now, the question is: where is the milk coming from? Even under normal conditions, milk production varies between summer and winter. Milk holidays are observed in summer because there is too much of it, whereas powdered milk is used to meet the demand in the dry season. So, what is consumed as fresh milk is not necessarily fresh. One can even go further and be surprised to note that there are malevolent persons who have invented something like Synthetic milk and have the audacity to sell it as fresh milk. Synthetic milk looks like natural milk, except in taste and nutritional qualities. However, the cost of producing synthetic milk is less than half of natural milk. Invented in Haryana in India by some milkmen about 15 years ago, synthetic milk spread to other milk deficit parts of India. Synthetic milk is prepared by blending urea, caustic soda, cooking oil, and detergents. Once prepared it is very difficult for common users to detect urea, caustic soda, starch/ glucose, sugar, or nitrate etc. Detergents emulsify and dissolve the oil in water giving the frothy solution, the characteristic white colour of milk. Cooking oil is used as milk fat. Caustic soda neutralizes acidity, which prevents the milk from souring. Urea/ sugar acts as solid-not-fat (SNF) – a major component of milk. Once mixed with natural milk it is even more difficult to detect it. Synthetic milk is harmful to humans, but is more harmful to fetus and persons with heart and kidney problems. Urea and caustic soda are very harmful to heart, liver and kidneys. Kidneys have a difficult time trying to remove the urea from the body. Caustic soda deprives the body from utilizing some essential amino acid. Despite repeated action by the police to unearth the racket in India, the practice continues. The recent one has been reported in May 2013. It is not to suggest that synthetic milk is already in the dairy market in Nepal, but one cannot rule out the possibility of it being used by unknown, unregistered milk vendors or even dairy workers to make extra money. Especially when one has seen animals bones, plastics, old rags being used in brewing low grade alcohol, what is being pumped into our food system is any one’s guess. The assumption that more trees equals more water (which has inspired most forests and water policy) is based on incorrect understanding of the hydrological cycle in forest ecosystems, according to the FAO. FAO’s forestry paper 155 ‘Forests and Water’ published in 2008 stated in its executive summary that the forest ecosystem is in fact a major user of water. Tree canopies reduce groundwater and stream flow, through interception of precipitation; and evaporation and transpiration from foliage. It further stated that as both natural and human-established forests use more water than most replacement land cover (including agriculture and grazing), there is no question that even partial forest removal increases downstream water yields. It was probably the first time that a debate about a contentious subject as the role of forests in regulating or enhancing stream flow, which has continued throughout history, has now been explained with the help of science. It has already been five years since the revelation; nevertheless, it went unnoticed in the mainstream environmental field. It must be stressed that forests are very important source of timber and fuel wood. Forests maintain greenery and help maintain forest ecosystems as well as natural habitat for wildlife and thereby support biodiversity. Forests are equally important to capture carbon. But its role in regulating stream flow and conserving water has been extended far beyond. In fact, the debate about forest – water relationship has continued since the Roman era. Romans who championed the skills of solving the problem of water supply to the people of Rome by developing aqueducts circa 312 BC, were already debating about how forest are important in reducing floods and preserving water sources. The story goes something like this. Romans required huge quantities of timber for mining, and heating, as well as for construction and the production of iron and other metals. As a result, forests were depleted particularly in the Mediterranean basin which had been largely denuded by the beginning of the Common Era. About the same time, the Romans suffered frequent floods and droughts. Since forests were being cut to meet the timber and wood demand, the fluctuating water level in the streams and rivers were thought to be the result of deforestation in the hills. The debate continued and efforts to protect forests as well as deforestation went on throughout the history in Europe. Louis VI of France issued an ordinance in 1215 with regard to forest and water. Swiss communities began establishing protected forests in 1342. Many protected forests had been established by the 16th century. With industrial revolution in the 18th century, demand for timber increased and so did deforestation as well as the effort to protect forests. Increased events of floods in the streams and rivers in France, Austria, and Italy were considered a result of deforestation in the Alps. Series of articles published attracted the attention of the then rulers, who made rules for forest protection. The story in North America was not different. The new European settlers cut vast tracts of forests to establish farms in order to supply food and timber to Europe. Floods events here were also attributed to deforestation and legal measures were taken to protect forests. After a two decade long debate, the state of New York established national forests in 1891. But critics began asking for scientific basis behind the logic of protecting forests to reduce floods. Critics asked the reasons for occurrence of floods before the settlers arrived and cut forests. Scientific research in the first half of the 20th century gave enough ground to argue against the belief about the role of forests in controlling floods and regulating dry season flow. However, the environmental conference held in Stockholm in 1972 and subsequent publication of the book Losing Ground brought forth the theory of Himalayan Degradation, which once again bolstered the preconceived belief about deforestation and increased floods. With all the investments in protecting the forests (which has been quite successful), floods and droughts continue to impact our lives. Finally, with the FAO revelation of 2008, we can be assured of how much to expect from forests in maintaining water flow. It is a challenge for people living in the present day to reflect on the debate that has gone on for over two millennia and pause to take note of the happenings today. The FAO’s revelation is important and provides us with critical lessons to consider as we wrestle with the importance of protecting our own critical watersheds in Nepal. 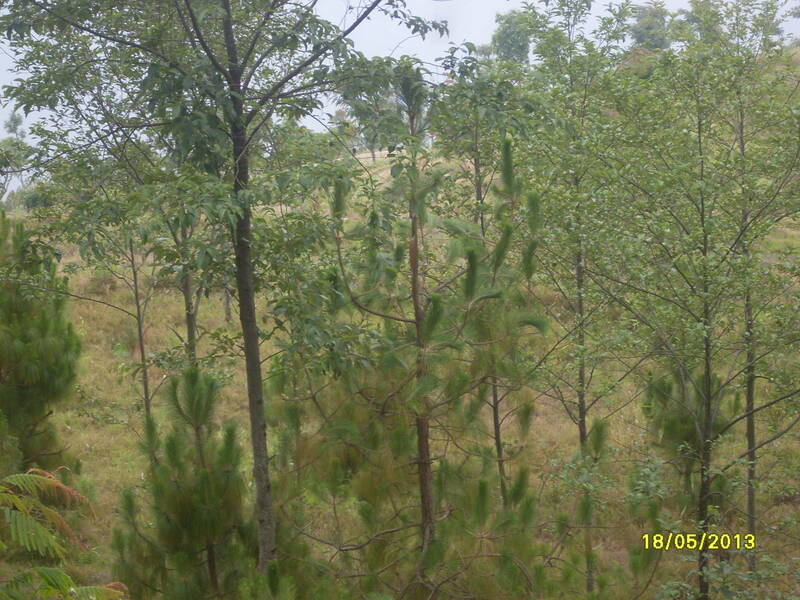 Pine trees (Khote salla) growing in the abandoned terraces and slopes in the eastern Nepal (seen in the picture above) is perhaps signalling a different message than what has been made to believe. The fact is that Khote salla grows in dry places and not that they make places dry. The spread of pines in Panchthar district perhaps indicates that the hills and mountains in the eastern parts of Nepal have gone dry. We have seen that old springs have disappeared for years. One of the reasons for this is the impacts of repeated earthquakes since 1988 together with the expansion of network of rural roads across the mountains that have diverted the runoff filling the groundwater aquifer. Change in temperature and rainfall, if it has occurred significantly, would not have impacted water sources to the extent as has been seen in the area. The lesson is that when systems begin to collapse or change from one system to the next, the fallout is often visible even in the most unexpected places for everyone to see and perhaps be sorry for being unmoved by the writing on the wall. Spreading khote salla is perhaps telling a similar story about changing hydrological regime in the area. Sharing this T-Shirt picture on this Earth Day 2013 to revisit our thoughts and concerns of the 1996 when this T-Shirt was made to highlight water problems. Paddy farmers in Panchkhal Valley east of Kathmandu were seen last monsoon carrying kerosene jerry cans to run water pumps to irrigate their paddy fields. Ordinarily that would not be surprising, but this was the middle of the monsoon. At a time when streams here in Kavre district would be swollen, they were dry in July. Jhiku Khola, the lifeblood of this valley, did not have a normal flow even in August, behaving more like a season stream. Much of the upland rice terraces would have remained fallow if it hadn’t been for the water pumps, which run on kerosene because of the electricity shortage. Natural springs, which should have been gurgling with water were still dry. The monsoon has been arriving late by up to two weeks for the last few years, which is delaying rice plantation, reducing ripening time and harvests. In many places across the country rice plantation has been affected by delayed monsoon. In Dhankuta in eastern Nepal, only about half the paddy has been planted last monsoon. Hill farmers wait till the first week of August, and if still does not rain adequately, the drop in harvest doesn’t make it worthwhile. The riddle for us was why the Jhiku Khola in Kavre was dry even in the middle of the monsoon. Lakes, ponds, reservoirs, and aquifers in the hills are full in the four monsoon months even when only a fraction of the precipitation seeps underground to recharge groundwater. That groundwater seeping out of mountain slopes (mool) is what people in the hills depend on for their water needs. Traditionally, Nepalis have names for three types of springs in the mountains: the more or less permanent sthayi mool at the foot of hills, the one that comes to life in July called asare mool and then the saune mool that bursts in August. The timing of springs indicates the extent to which the monsoon has replenished ground water reserves in the hills. After mid-September saune mool first begins to dwindle, whereas asare mool continues to flow for a longer period, sometimes even until November. Interestingly, the saune mool does not burst every year, and farmers know that in such a poor monsoon year bumper winter crops can never be expected as the streams too will dry out sooner. There has been a reduction in groundwater recharge in many parts of the country in the last few years. Some villagers in the hills of Taplejung and Ramechhap representing High Himal and middle hills of Nepal even had to shift to lowlands because their springs had dried out. The village of Dhe in Upper Mustang in the trans Himalayan region lost its spring and the entire village relocated across the Kali Gandaki River. Villagers can move, but when entire regions begin to suffer as is happening in Kavre, it requires serious new thinking. Farmers in Panchkhal had to use water pumps because asare mool did not come to life even in the middle of the monsoon. It is unlikely that saune mool will appear this year, and this means Panchkhal will suffer yet another winter, sixth year in a row, of acute water shortage. All this is indication that Panchkal, Ramechap, Taplejung are facing rainfall variability, most probably due to climate change. Some other factors may also have contributed to low discharge in mountain springs. The expansion of road networks in the hills tends to disrupt natural drainage channels on slopes by diverting runoff elsewhere. The depletion of the groundwater table in the Tarai is being caused by over-extraction of ground water not only within Nepal but also across the border in India. But the case in the hills is different: water flows down due to gravity. The springs have ceased to flow in many places at a time when they are expected to be flowing in full capacity. If what is happening to springs is an indication of a fundamental shift in the timing of rainfall, its distribution, impacts of building road networks, and a lasting change in water regime, it will have major impact on hill agriculture. The crops we grow, the level of production, cropping cycle, dairy production, and overall food security will all be affected. It will take a long time before we adapt to the changed timing of the new water cycle. The Himalayan Mountains have been described as a ‘water tower’ that stores water as snow and ice and its melting in the dry season brings water to downstream areas. But it now seems like the Himalayan highlands are more like a gigantic sponge that stores ground water, and erratic rains can affect groundwater supply and affect a lot more people. This article has also been published in The Nepali Times, a national weekly.